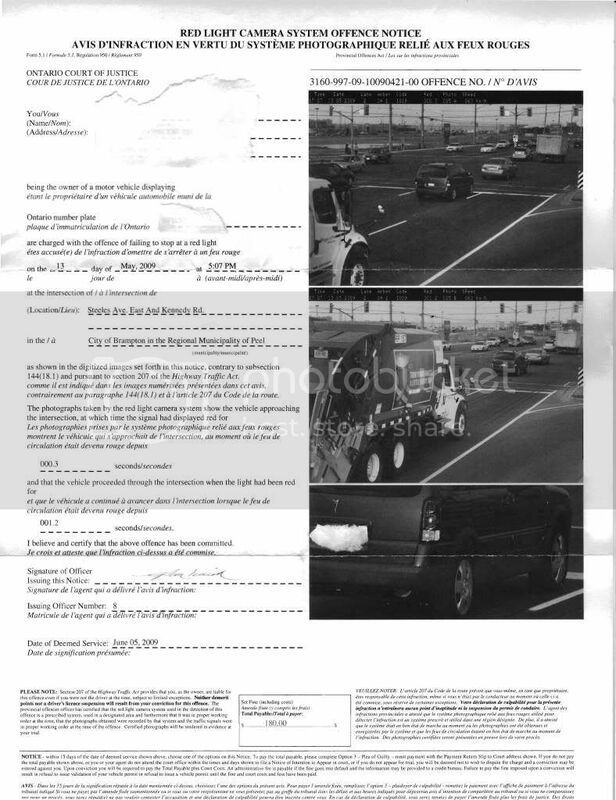 Hi, I just received a notice in the mail with pictures of my car going through a red light. Ticket is in my husband's name, as he is the car owner, but I drive this car. I'm guilty as can be... can't remember doing it, but apparently went right through intersection after light turned red. I realize there are no demerit points with this ticket, but ticket is for $180!!! 2 questions: Do you think there is any way the prosecutor would let me "plead down" to a lesser fine, even though it's clear in the pictures I'm guilty as sin?? Does it make any sense that it's my husband being ticketed although it wasn't him driving?? The red light camea ticket goes after the vehicle plate owner. It doesn't matter who was driving at the time. The ticket is one of the more complicated tickets to fight. It also is one of the easiest to plead guilty to. It carries no demerit points, it does not affect your insurance and if you request a trial (option 3), go to court and then offer to plead guilty, the fine is usually halved, around $60 - $75 plus victim surcharge and costs. There are a couple of technical points you should be aware of. 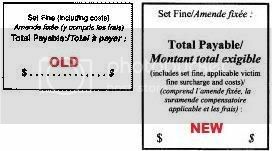 The ticket you received has recently changed and some jurisdictions are still issuing the wrong version. In other words, the ticket could be invalid. Also the fine amount just recently changed. If the fine on your ticket is incorrect, that would also invalidate the ticket. This depends on the date of your offence. If you want to fight the ticket, then please scan it and post it here, blocking out your personal information and licence plate. We can examine it and tell you if it's valid. Otherwise, a negotiation with the prosecutor will get you a 50% discount. Thanks so much for the info! I will get my scanner working and scan it. Otherwise, if it's valid, i will definitely attend and plead. open an account at http://www.photobucket.com and then upload it there. thanks, Reflections, for explaining how to upload. I've uploaded the offence notice as a JPEG on photobucket. Let me know if you can't view it... this is my first time doing such a thing. I'm not very computer savy!! The views are good. I have no further comment. Naomi, your ticket is invalid. The ticket you have is called a "notice of offence" and it is covered by Regulation 950 of the Provincial Offences Act. But would such an argument be enough to throw out the charge?? Or would they just "re-issue" me a new ticket? Are you saying that when my trial day comes instead of trying to "plea bargain" down to a lesser fine, I should fight it entirely based on the fact that it's the wrong ticket issued? Is there somewhere online I can download more info on the change? Does the ohta website have anything on this ticket? I tried looking through their website, but didn't see anything. oops, I just noticed your link to canlii and looking over that now... thank you!! i already have a court date set in november.... in my defense i will first argue that i was making a right turn and did not go through the red light. if that doesnt work, then i will argue that they sent me the outdated ticket. Ague the invalid ticket first before pleading. The right turn argument can be made during trial. Was your ticket in Peel as well? I have been following these boards closely as I too have been issued with a red light camera offence notice. Unfortunately, the city of Mississauga issued me a court date in mid-Sept when I went to request a trial (no unreasonable delay there!). I also received the same form (5.1) as Naomi did and will be utilizing that defence prior to pleading. However, I found an interesting ruling from the COURT OF APPEAL FOR ONTARIO regarding the admissibility of the photograph(s) as evidence (Waterloo (Regional Municipality) v. Yan, 2004 CanLII 32076 (ON C.A.)) which may assist some. The important sections of the ruling are 26-31. Essentially, the court ruled that the photograph "must" display the date, time and location of the offence either within the photograph itself or superimposed on it. The use of alpha-numeric values, without any means to interpret them, are not sufficient (32). Looking at your photo naomi, it seems that while the date and time are listed on the top of the photo, the location is not (at least not intelligibly by a common person). There are also no street signs indicating the location of the offence (photo is a bit grainy so I may be wrong). Hence, the photo of your offence is inadmissibly (as the location of the photo cannot be sufficiently established) meaning there no longer is any evidence against you. Personally, this ruling may not apply to me as one of the street signs is visible in the photographs of my offence (Airport Rd). So the photo places me at one street but not the other. I don't know if this appeals court ruling can work for me, but it will be part of a defence I mount. Hope this was of some help. Best of luck. ticketcombat wrote: Ague the invalid ticket first before pleading. The right turn argument can be made during trial. Was your ticket in Peel as well? my ticket was in scarborough or city of toronto. I got a ticket too and it happens to be invalid (old version)!, Interesting. In my case was a friend who was driving my car. Is there any chance I can plead guilty (Option 2) and get a lesser fine?. My record is clean, this is the first ticket I got and now I know the ticket is invalid. Is it for sure that this kind of ticket is not going to affect my insurance?